Our family gets more and more active every year with the kids growing up and entering into new activities and commitments. Real food is the fuel at our house, and teaching our girls how to make a smoothie was one of the first lessons I gave them in the kitchen. I learned early on with them that the more time I spent with them in the kitchen, the more they were interested in their food. If they helped in the garden, they would try more vegetables. If they got to make the salad, they would try the goat cheese I put on it. If they got to mix the batter, they’d be the first to try whatever I was baking. It’s fun to watch them step into their own now that they are both getting older and know their way around the kitchen. The first step to making a fantastic smoothie is only keeping real whole food ingredients in your kitchen. With these foods, you and your kids can make anything. Knowing their way around the kitchen, and where things are kept (from ingredients to cooking utensils) are an easy second step. From there a basic teaching of how to run your blender or food processor, initially under your supervision, and then on their own once they’ve got it mastered, and you’ll have yourself kids that are confident not only eating what they make on their own, but willing to try just about anything you put in front of them. 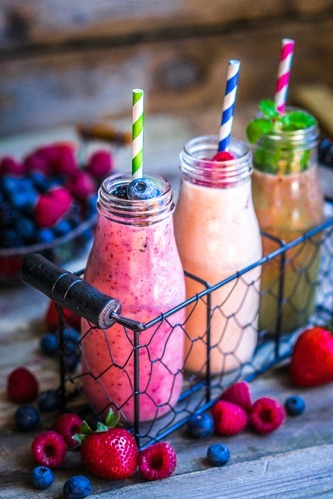 You could use 8 ounces of the following to start out a smoothie: water, coconut water, juice, kefir, coconut/almond/hemp/flax milk beverage, or a combination of 4 ounces yogurt/4 ounces water, or 4 ounces full fat coconut milk/4 ounces water. 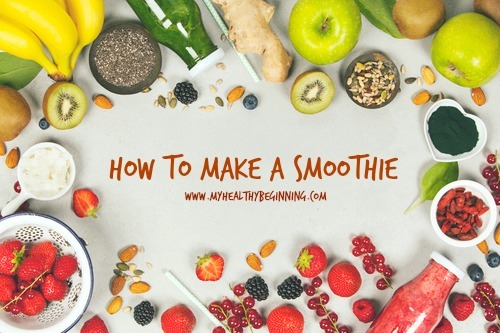 After you’ve made a few smoothies you’ll start to get a feel for the texture and thickness you like best. There are plenty of protein powders out there, and after trying what feels like a bazillion of them, I like the Dynamic Paleo Protein powders in vanilla and chocolate the best. It’s beef protein based and stevia sweetened and pairs really well with other added ingredients I might pop into the blender, though also tastes good if I need to just shake it into a blender cup with water on the run. There are pea proteins, rice proteins, whey proteins, and soy proteins…soy proteins are the ones I advise most people avoid. You might also use collagen, which is great. You could buy it flavored or not, which is different than most protein powders as I think they need the flavor to mask their taste! Using straight up raw eggs from a trusted source is another option as well. Goat milk kefir with a raw egg and some frozen berries and greens makes up a fantastic smoothie. There are sooo many greens powders around these days, I can’t even keep track of everyone I’ve seen and tested on people. These are typically concentrated greens that I find are often mixed with fruits to sweeten them a bit. I actually find I prefer to use a handful of fresh greens in my smoothies, whether it be swiss chard, spinach, or baby kale. Sometimes I’ll buy the large bag of PowerGreens at Costco and find I can put that away almost solo within 10 days. One cool tip I’ve got is at the end of summer/early fall when you’ve got all those greens left in the garden. Blend them with just enough water to to break them down and freeze them in ice cube trays. Pop those frozen cubes into a gallon ziploc and grab a handful of them to add to your smoothie as needed. Super easy and so fresh. A great way to get healthy fats is through full fat coconut milk. You could also add a dollop of your preferred nut butter. Even a tablespoon of coconut oil in your smoothie is a great way to have your brain feel full and offer you a longer cleaner fat burn throughout the day. Costco now sells a bag of frozen avocado chunks to make your life easier. These are great as you can grab a few of those and pop them in the blender and they’ll not only add great texture, but they will also have you feel more full for longer. For those of you who are Bulletproof coffee followers, MCT oil is another great option. Hemp hearts and chia seeds also give you a big bang for your buck in the healthy fat department, and they also add texture to your smoothie. To keep it simple, I use frozen fruit almost 100% of the time. With the ability to buy organic produce in bulk at Costco, we always have 3-4 bags at any given time in the freezer. Along with smoothies, the kids make ice cream, sorbet, and fruit leathers on the regular, so they are a must for us. We annually pick berries, and order in bulk from a Michigan orchard dark cherries and 10# blueberries, so we’ve always got enough in the freezer. This also allows for variety as it’s difficult to monitor how much fruit my little army will go through on any given week—-there would be no fresh fruit left for smoothies if I didn’t also have some stored in the freezer. A tip about using bananas….these guys are high in sugar, so we began only using a half banana per person in our smoothies. Now, they give smoothies a fantastic soft and creamy texture, so we don’t like to do without. To use less, what we do is peel, slice like coins, freeze, and then store in a gallon ziploc. When it’s smoothie time, grab a few frozen coins and toss into the blender. You’ll have added a thickener and a nice texture with a bit of sweet and it’ll be perfect. The sweeter and more milkshake-like you want your smoothie, the more banana you’ll use. Hemp hearts, chia seeds, spirulina, greens powders, nut butters, coconut butter, and bee pollen. These can all be purchased both online and in natural foods stores these days and are easily accessible. To make your smoothie, I recommend first adding the liquid, then the fresh greens. To the top of that add about 1/2-3/4 cup of fruit, and any additional ingredients. Close, blend, taste, and serve. **if for whatever reason your smoothie isn’t sweet enough for your taste, add a bit of honey or stevia. Previous post: Have you tried eliminating this food group?